Judging Day went fast and the girls did a great job! Now we all have to wait for the results on July 11. Hope to see everyone there on July 11...Girls need to be there by 7:30 and the pageant starts at 8pm. More Pictures...Float and Pizza Party! Float is not done quite yet but we are getting closer! Monday, June 29 - 11:00am – 4:00pm ??? 4-H QUEEN JUDGING held at BRANDYWINE Community Church, Greenfield. The judging day is closed to the public. Candidates only. Below are videos from the pizza party. The girls were blind folded and given a farm animal. They crawled around on the ground making their animals noise and trying to find their group. HILARIOUS to watch! Then their group had to come up with a rap for the fair. The first video is of the group that won! Next event is queen judging. NEXT EVENT: Christine's house for a pizza party! Call or email if you can't be there. June 23 at 6pm....Hope to see all the girls there! 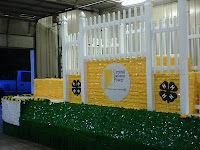 This is the middle stage of our float makeover! Stay tuned for the final product! After the workshop today we had a luau. The 2009 Indiana State Fair Queen joined us as well as 2008 Hancock County 4-H Fair Queen. The girls invited a lady guest to join them for lunch. We discussed the plans for the pageant, the queens talked to the girls and gave a speech, the ladies got to ask questions while the contestants played games. We played limbo, hawaiian sack race, show us your best dance move, and pterodactyl! They had a blast playing games. When the ladies rejoined us after question/answer time we played musical beach towels. The girls learned how to walk in their heals, put on make-up correctly, and interviewing skills today! Above are some pictures from the workshop portion of the day. PRESENTATION WORKSHOP at MOHAWK UM Church, Greenfield. This workshop is for the candidates only. Dress casually and please bring suits, dresses, jewelry, or shoes for help and opinions. *PLEASE NOTE-the Luau will take place immediately after the presentation workshop. Please have your female guest arrive by 12:30pm after the workshop. QUEEN CANDIDATE LUAU at MOHAWK UM Church, Greenfield. Instructional gathering for Queen Candidates and one female adult. Food will be served with other royalty guests and 2008 Hancock County 4-H Fair Queen, Christine Edwards, being in attendance. The State Fair Queen will also be attending our Luau. We can't wait to meet the candidates! June 1 your application is due at the Extension office! DEADLINE FOR APPLICATION to be delivered to the 4-H Extension Office by 4:00pm. No Exceptions! Please include a clear head and shoulder picture with the application. Here are some pictures from the information meeting. Informational Meeting will be held at the extension office on May 3. Hope to see lots of girls there! *All Queen Candidates need to be present at all Pageant events. If there should be a conflict with any of these dates, please contact a committee member as soon as possible. Thank you! PROSPECTIVE QUEEN CANDIDATE MEETING/APPLICATION WORKSHOP at the 4-H Fairgrounds. The meeting will be held in the Extension Office. This is an optional meeting designed to give you an idea of what being a 4-H Queen Candidate is all about. It is highly suggested to come and get help on how to properly fill out your application. PRESENTATION WORKSHOP at MOHAWK UM Church, Greenfield. This workshop is for the candidates only. Dress casually and please bring suits, dresses, jewelry, or shoes for help and opinions. *PLEASE NOTE-the Luau will take place immediately after the presentation workshop. Please have your female guest arrive by 12:30pm after the workshop. QUEEN CANDIDATE LUAU at MOHAWK UM Church, Greenfield. Instructional gathering for Queen Candidates and one female adult. Food will be served with other royalty guests and 2008 Hancock County 4-H Fair Queen, Christine Edwards, being in attendance. REHEARSAL in 4-H Bowl at Fairgrounds. All Queen Candidates need to be present. If times interfere with other 4-H activities, please talk to the Queen Committee as soon as possible. 4-H QUEEN PAGEANT in 4-H Bowl at Fairgrounds for public crowning of 4-H Queen and Court. Please be dressed and at the stage 30 minutes before designated time. 4-H FAIR PARADE – All Queen Candidates are required to ride on the Queen Float. Candidates will meet at Fairgrounds North Parking Lot no later than 1:30. We are at the very beginning of the parade line-up. Everyone please bring a towel and umbrella. You may bring candy if you choose to do so. *Central Indiana Power’s sponsorship ends with the crowning of the 4-H Queen. A schedule of activities for the Queen and her Court, to be used at the County Fair 4-H events, will be furnished by the 4-H Queen Committee. The Hancock County Queen will enter the Indiana State Fair Queen Contest in August, if she complies with the State Fair rules and regulations.